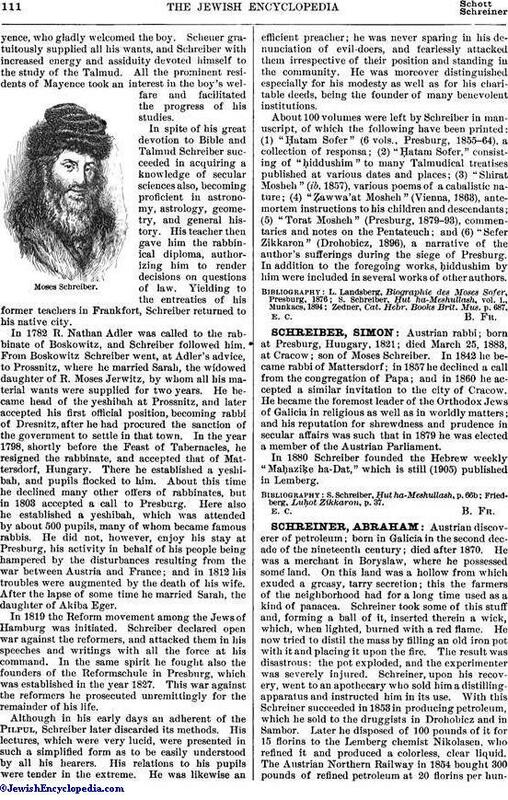 Austrian rabbi; born at Presburg, Hungary, 1821; died March 25, 1883, at Cracow; son of Moses Schreiber. In 1842 he became rabbi of Mattersdorf; in 1857 he declined a call from the congregation of Papa; and in 1860 he accepted a similar invitation to the city of Cracow. He became the foremost leader of the Orthodox Jews of Galicia in religious as well as in worldly matters; and his reputation for shrewdness and prudence in secular affairs was such that in 1879 he was elected a member of the Austrian Parliament. In 1880 Schreiber founded the Hebrew weekly "Maḥaziḳe ha-Dat," which is still (1905) published in Lemberg. Friedberg, Luḥot Zikkaron, p. 37.